Living near the Continental Divide, it’s less of a pilgrimage and more of a common occurrence to drive over it. We readily take in the view, but don’t typically think about this mountain ridge as a defining boundary. This divide had significance for indigenous populations and pioneers, for animals, weather patterns, and the subsequent precipitation that falls, either being directed towards the Pacific Ocean or the Atlantic. At the top of the Continental Divide, mere inches make a difference as to where that raindrop will travel. A watershed is defined as an area of land upon which precipitation falls and eventually collects at a common outlet; as a human, it is impossible not to be in a watershed. The map of watersheds becomes more nuanced as the Atlantic and Pacific watersheds, or basins, of the continental U.S. are divided further and further. The Colorado River Basin alone is divided into an upper and a lower. The Upper Colorado watershed is one of nine watersheds in the Upper Colorado River Basin. The Upper Colorado watershed can be further divided into about six watersheds, depending on who you ask, and then an innumerable more when you divide further, into tributaries of tributaries. The middle Colorado watershed, the region that the Middle Colorado Watershed Council works to protect, stretches from the top of Glenwood Canyon to De Beque. 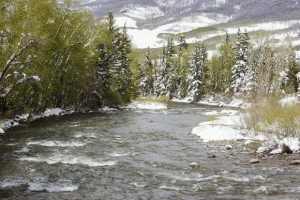 The Roaring Fork River is one of the largest tributaries into the Colorado River, but it doesn’t fall into the region where the Middle Colorado Watershed Council works. 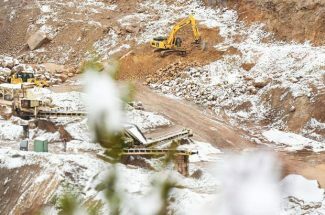 Humans have made artificial divisions along the rivers for organizational and management purposes; the Roaring Fork Conservancy works in the large Roaring Fork watershed, and then the council takes over when it joins the Colorado River. The Flat Tops, the Roan Plateau, Thompson Divide and Battlement Mesa set definitive high boundaries for the middle Colorado River watershed, but the noninclusion of large tributaries and the divisions upstream and downstream that divide watersheds are artificial divisions. John Wesley Powell, in the late 1800s, was worried about water, natural boundaries and human settlement, the effects of which we’re seeing today. Best known for his work with the U.S. Geological Survey and his expeditions down the Colorado River through the Grand Canyon, Powell is also known for arguing caution regarding development of the arid West, and for drawing a beautifully colored map of the watersheds within the arid region of the western United States. Arcing lines follow mountain chains and ridges, alternating pastel shades of blues, greens, browns, yellows and reds overlay the delicate, sparse typography typical of antique maps. One of Powell’s principal arguments was that the boundaries of the western states should be drawn along watershed boundaries, so that states could decide for themselves how to best use their precious resource and to avoid inter-state disputes, one thing that has been common in water news this summer. Even still, the Colorado River Basin wouldn’t have been one large state, and so there still would have been the issue with certain states being upstream of others. 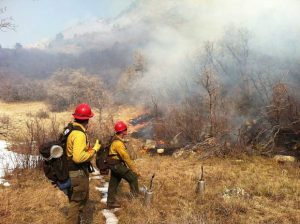 The area of Colorado was destined to be an upstream state, with obligations to maintain healthy stream ecosystems for the use and enjoyment of others downstream. Working with hindsight and thinking about what might have been isn’t necessarily helpful, and perhaps there would have been similar unforeseen consequences had Powell’s recommendation been adopted. It is helpful, however, to accept his caution and demonstrate appreciation of our resources. Consider tasking ourselves to recognize and know our watershed, its boundaries, its diverse needs and challenges, as we would our state’s sports team, and ask visitors to do the same. Jon Nicolodi writes a monthly column for the Middle Colorado Watershed Council, which works to evaluate, protect and enhance the health of the middle Colorado River watershed through the cooperative effort of watershed stakeholders: anyone standing in the watershed. To learn more about the MCWC, visit http://www.midcowatershed.org. You can also find the Council on Facebook at http://facebook.com/midcowatershed.